How to Make a Green Smoothie | Ultimate Money Blog- Save Money and Live Green! I’m going to start highlighting some foods that are fairly inexpensive and are very good for your health. Today’s focus is on the green smoothie. Every day I start my morning off with a delightful green smoothie. At first I was repulsed by the idea (and the look!) but after I got down the art of making them, I was addicted. There’s nothing to help detoxify your cells and brighten your day than a green smoothie! Green smoothies are fairly inexpensive to make, and pack a huge nutritional punch. They may look funny, but they don’t contain any unpronounceable ingredients. Green smoothie recipes are simple to me: pick any leafy green you want, throw some fruit in (normally not more than two-three like fruits), add some water and ice, and blend. I like to keep my fruits in the same “family”, like mango, pineapple, strawberry, or orange, banana, and kiwi. I think it makes the smoothie taste better. I try not to add too many different fruits because sometimes it is hard to distinguish the flavors of the fruits. One of my favorite things about making green smoothies is that they save me money and food waste. If I’ve got some bananas that are about to go bad, I toss them in the freezer to save for a smoothie. When I buy the 1 pound spinach from Costco, I wouldn’t be able to use it up if I didn’t make green smoothies. That’s a lot of spinach! You can throw pretty much any fruit or veggie into your green smoothie, which helps reduce any food waste and helps keep your body healthy. I’m also pretty lazy in the morning, so throwing ingredients in the blender and mixing makes me happy. Easy peasy! -Greens. Any type of greens will do, but my favorites are spinach and Swiss chard. They are very mild, and if you don’t use too much, you can’t taste them in the smoothie. -Fruit. We buy a large bag of frozen strawberries from Costco just for making smoothies. We also go crazy buying bananas that are almost brown and discounted in the store and freeze them. They taste great! Basically, any fruit will do. 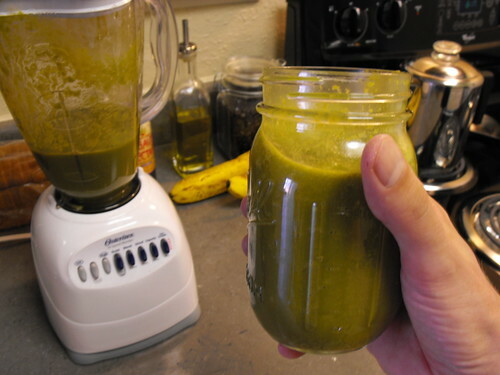 Blend a handful greens with a cup of water in your blender. Make sure you blend it until it looks like green water. Throw in a banana (or whatever fruit you choose). Blend until smooth. Add in frozen strawberries and pulse. Blend until incorporated. At first, I would add in very little greens. Then you can gradually work your way up to more greens. Greens are fabulous for your body because they contain Vitamin A, Vitamin C, are good sources of calcium, magnesium, and folic acid; and help detoxify your body. Fruit is full of antioxidants and tastes yummy. Green smoothies are inexpensive, so healthy for you, and a great way to reduce food waste. Give them a try! You’ll be glad you did. Have you heard of green smoothies? Would you try them? Yum! I was recently thinking about smoothies and how people just don’t appreciate them (especially the green breakfast variety here in France). But what a great way to get more fresh greens into your diet. I may go back to it anyway and freak out my husband, my in-laws. . .everyone that finds out about it. I mean, if the French can eat blue and green cheese, what’s the biggie with a green smoothie? Sounds like a great way to sneak some extra nutrition into your diet. My wife makes fruit smoothies all the time and our kids love them…we’ll have to try your green smoothy out too! I love adding spinach to my smoothies, as well as soy or rice milk for a richer consistency. Yogurt is a great addition too, as well as honey if you’re feeling luxurious! We don’t have a blender right now, or else I would be making green smoothies a couple of times a week! Sounds easy. I’d like to try it! I’ve had wheat grass drink before & think it’s pretty good. =) I’m usually willing to try anything. I just threw some bananas in the freezer; I need to try this! Heather, I am in love with my Magic Bullet when it comes to making smoothies quick and easy. The kit comes with a couple of mug-style mixing cups with lids so you can mix your smoothie and take it with you. On a list I’m on, several people had suggested the Magic Bullet for its ease but I resisted not wanting to put out $50 when I had a perfectly good blender. But since my MIL bought me one for Christmas a couple of years ago, I’m totally sold on them. Hi! I didn’t have any greens, but this morning I made a smoothie with strawberries, raspberries, and blueberries from freezer. I added flax seed and yogurt, plus milk. I got fruit, calcium, and energy all in this morning. I am going to get some spinach to make a green smoothie tomorrow. My blender goes in dishwasher, so it is no differnt than watching a bowl. Thanks for the green smoothie tips. yum! i use my juicer to make a green lemonade type drink every day. i put whatever fresh veggies & fruits i have in it. i will have to break out my blender and try one your way. I wonder if I have the courage to try this. I do love greens in general, but normally I like them cooked, with butter and salt. I’ve never really thought of drinking them in a smoothie. Mrs. Money, I couldn’t even read the whole post because of the picture. It looked like that bottom of my lawnmower. I’m sure it tastes great and is less filling, but it’s not for me. Maybe a triple choc fudge smoothie would be better. Oh wait, probably not the healthy choice. You’re speaking my tune with this one. I just twittered @singlema about the mango-spinach-banana smoothie I made. MMMmmmm-mm! Strawberries, blueberries, mixed berries… all good. I will soon be able to introduce dairy and I can’t wait to start having my kefir again. Can’t believe I’m saying that as I have never cared for kefir, but maybe my tastes will change since I have eliminated all processed foods. I have Swiss Chard in my garden that would probably be great. How do you make 1 pound of spinach last for such a long time? LOL. With our family of four we barely get a half cup of steamed spinach so I rarely bother to buy it. I recently have tried green smoothies, and they aren’t bad! We have used spinach and kale and Romaine, along with bananas and misc. fruit. The key is adding a ‘fat’ content like banana or avocado to take away the greens taste. Yum. wish my work sold green smoothies. I would eat drink them for lunch, too! I’d try a green smoothie but we almost never have greens in the house that aren’t canned. Try OJ in place of milk with a strawberry – banana smoothie. Makes a great breakfast drink. And try honey in place of sugar. Just a bit of honey and add more as needed. One thing I was thinking about today – adding wheat grass in as the ‘green’ in this smoothie. Wheat grass is easy to grow and perpetuate on your own, and is super-inexpensive, too. It’s crazy-healthy and for those who don’t generally have fresh greens, it’s easy to maintain. Pingback: Meal Plan Monday | Ultimate Money Blog- Save Green and Live Green! Pingback: How to Make Apple Cider Vinegar | Ultimate Money Blog- Save Money and Live Green! Pingback: 7 Everyday Superfoods You Can Afford | Ultimate Money Blog- Save Money and Live Green! Pingback: Ways to Use up Eggs | Ultimate Money Blog- Save Money and Live Green!